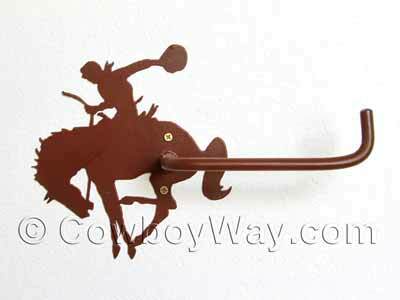 Below are cowboy toilet paper holders for sale on. The selection is usually excellent with a wide variety of toilet paper holders in cowboy, cowboy boots, spurs, horse, saddle, rustic, and more designs. Please scroll down lower on this page for toilet paper trivia. Below: A toilet paper holder with a cowboy riding a bucking horse. In 1700s Colonial America toilet paper was a matter of whatever was handy. Grass, leaves, corncobs, and other convenient (and disposable) items were commonly used. When newspapers and catalogs became widely available they became popular for use as toilet paper as well. The first edition of the Farmers' Almanac was printed in 1818 and from the beginning it was popular for both reading and for use as toilet paper. In 1910 the obliging folks that published the Almanac even began pre-drilling holes in the corners of the publication to make it easy for readers to hang in their outhouses. In the United States, Joseph Gayetty is usually credited as being the inventor of the first commercially available toilet paper. Gayetty's toilet paper was first marketed in 1857 and was sold in packages of flat sheets, not the rolls we are accustomed to now. The product was marketed and sold into the 1920s. By most accounts we could find Mr. Gayetty's invention was not all that popular: People failed to see the need to pay for something when they could use other materials (such as newspapers and catalogs) for free. 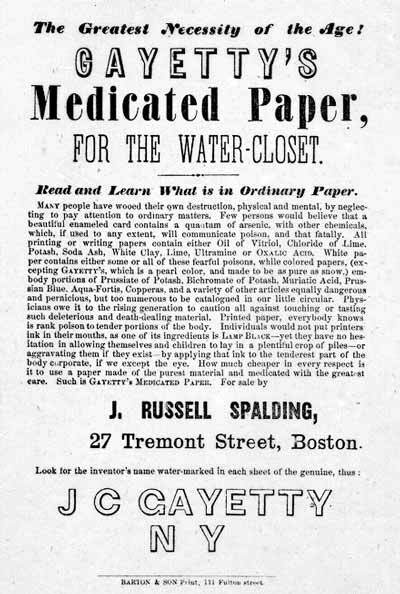 Below: An advertisement for "Gayetty's Medicated Paper For The Water-Closet," the first commercially available toilet paper in the United States. 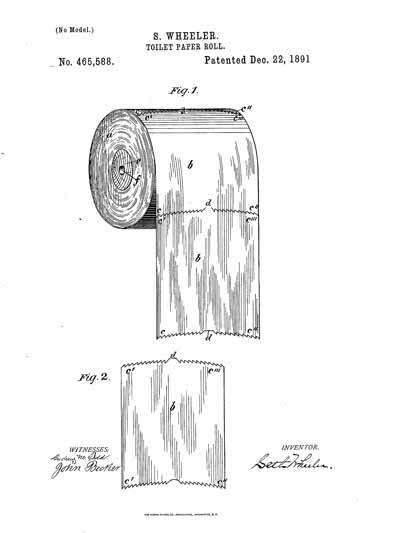 Below: Seth Wheeler's patent for toilet paper on a roll. In or around 1930 (dates we found vary) Northern Tissue (now Quilted Northern) began offering the first splinter-free toilet paper. They were so proud of this they boldly placed "Splinter-free!" on many of their early ads. Toilet paper didn't become widely popular and accepted until towards the end of the 19th century when more and more new buildings were constructed with modern-style, flushing, toilets. The new toilets couldn't accommodate flushing things like sheets of paper from newspapers or catalogs (let alone corncobs) so modern toilet paper, and toilet paper holders, were here to stay. If you find a toilet paper holder on Amazon you like but you're not ready to purchase it right away, you can always add it to your shopping cart so it will be easy to find later.